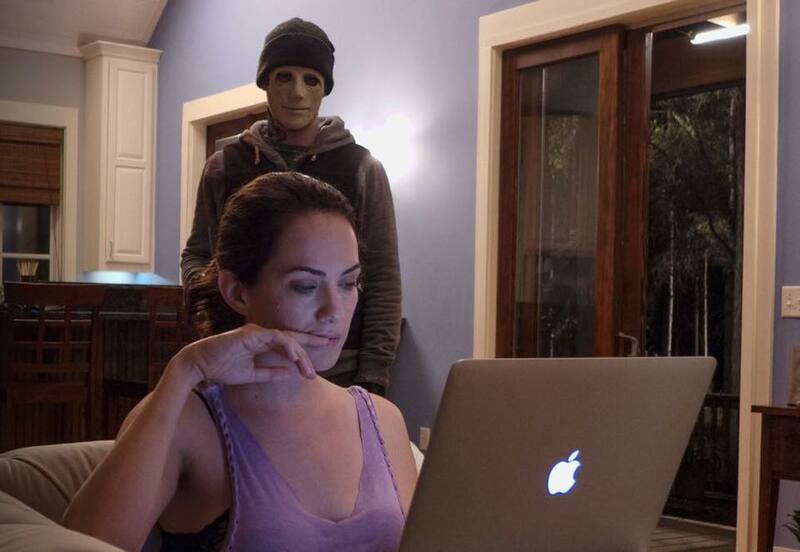 “Hush” is the latest Horror/Thriller from Writer/Director, Mike Flanagan (Oculus and Absentia) and stars his wife Kate Siegel (who also Co-wrote the film). 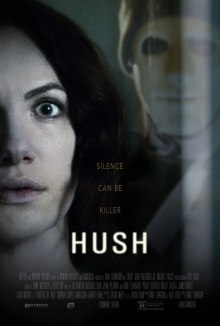 Hush is a home invasion thriller about Maddie (played by Siegel) a young, deaf-mute woman whose stalked by a psychotic killer (John Gallagher Jr.) in her secluded home in the woods. The film also stars Michael Trucco, Samantha Sloyan and Emma Graves. The home invasion sub-genre’s long since made for an interesting premise for a Horror film, I just think there’s something exhilarating about watching the safety and comfort one finds in their home being threatened by outsiders. Don’t get me wrong, said situation would be beyond terrifying and I’d be the first to run and hide but that doesn’t stop us watching 90 fictional minutes of it from within the safety of our own homes (a little poetic if you ask me haha). 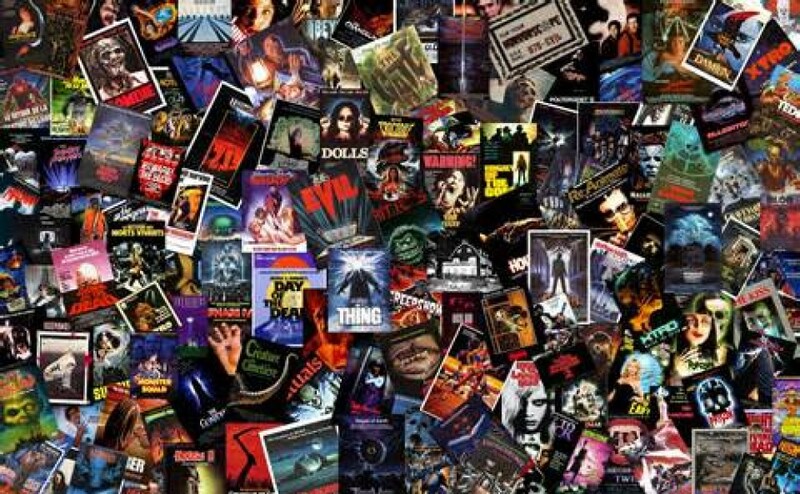 I’ve had my fair share of exposure to these types of films, so it’s natural and unavoidable to not draw comparisons between modern versions and past films. As I’ve already mentioned, being a huge fan of Home Invasion films, I try to catch as many of them as possible. I Initially discovered Flanagan’s film after reading a small article on one of the popular Horror sites, DreadCentral (of which I’m a fan). I caught a screenshot of the masked invader and a short synopsis of the film and that was enough for me to lock its April 9th release date in my phone. Mike shot Hush in Alabama and let me tell you, the location itself is wonderful. What’s better than a home invasion flick you ask? How about a home invasion film in an isolated setting, they’re the best kind, especially when coupled with a heroine whom is suffering from a hearing impairment. James Kniest, Mike’s DP (director of photography) who worked on 2014’s “Annabelle”, does a fantastic job of creating a claustrophobic environment in which Maddie tries to outwit her assailant. This is the type of film that’s crucial to draw audiences in immediately and what better way to do that then transitioning from a clever crane shot, tracking through the trees to reveal Maddie’s property, encompassed by a vast and heavily wooded area. It follows up with lots of quick cuts interchanging with and without sound as she prepares a meal. All the camera work is slick and Kniest is constantly on the move, although that movement is quite subtle and more voyeuristic. Opting for either a gentle focus or slow panning instead of trying to place you right in the action. Mike’s ability to gauge how much back lighting to use and what to keep natural etc, is key to building the tension. As the film progresses, with it, the lighting gradually gets darker, representative of the situation darkening as well as Maddie’s state of mind (not sure if that was the intention but effective all the same). It’s really the sound design and score that drives the tension filled atmosphere Hush delivers. The music from the Newton Brothers is a nice mix of styles and the perfectly placed, sharp and distinct sounds are sure to creep you out if you’re watching this the way it’s intended. What I enjoyed most about Maddie, was that even with her back against the wall she’s determined to fight to the bitter end, she refuses to play the victim. There’s a clear juxtaposition between her problem solving process and “The Man’s” approach to psychologically try to best her. Maddie internalizes dialogue and decision-making while dealing with the intruder because she has no other choice, she can’t hear and doesn’t fully trust her vision. The Man doesn’t realize that giving her time and playing that game of cat and mouse is buying her time. He thinks it’s doing one thing when in reality it’s doing another. 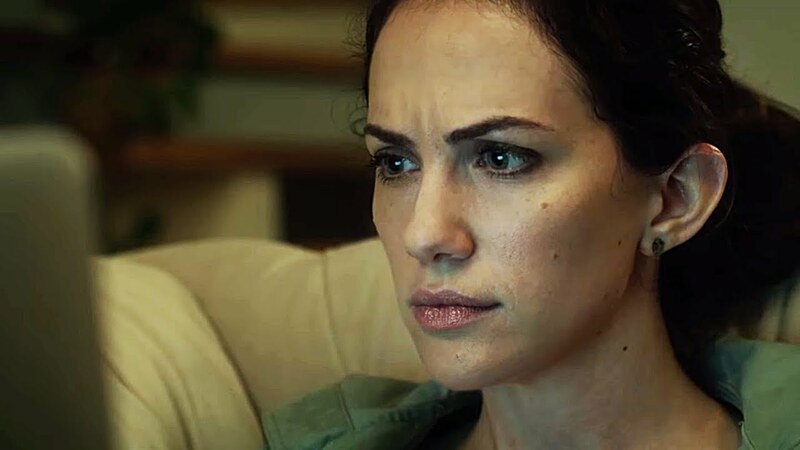 This was my introduction to Kate Siegel, it’s a demanding and challenging role that she tackles head on, never shying away from tackling sign language or only being able to react with facial movements and not dialogue. A very authentic performance and an easy character to get behind, well done Kate. I recently saw Gallagher Jr in the pressure cooker that was “10 Cloverfield Lane” and liked him immediately, he impresses once again in Hush. All we really know about this cross-bow wielding maniac, is that he feeds on fear, his motives are never truly revealed but there’s a telling confrontation with John (Michael Trucco) which offers more insight into his background than anything he says or does throughout the film. Hush isn’t what you’d call Action heavy but when things do escalate, there’s a nice display of practical blood. The obvious point to make about Hush is that the concept, like many, has been done to death. As I said, I love a home invasion film “Enemy Within”, “Home Sweet Home” and “The Strangers” are just a few of the standouts in my collection. Mike has structured his narrative a little differently to each of the aforementioned but there’s no denying the clear comparisons. The Strangers should need no introduction and If you’ve seen Enemy Within, you’ll know it’s about a girl with an impairment whose home is also invaded. Home Sweet Home is a Canadian film, that again is about a mysterious intruder who enters a young couple’s home to put his plan of psychological terror in motion. The mask in Hush closely resembles the one in Home Sweet Home and Gallagher’s weapon of choice being a crossbow, is very specific and originally used in Adam Wingard’s, “You’re Next” (although someone else probably used it before). You have to acknowledge how difficult it is these days to make something original. Even when you think you’ve got something, chances are it’s already been done before. Now that’s no reason to pick the film apart, it’s just something some critics concede and others should. Hush doesn’t have any issues as far as plot holes or filler goes, though the one thing that stifles its momentum somewhat is the quick reveal of “The Man’s”. That level of mystery collapses rapidly once the man is revealed to be Mr Gallagher. If we weren’t going to discover layers to his character arc, I would’ve preferred to see him as a faceless presence (or not see him to be more accurate). Leave the mask on and let us guess what he’s thinking or what he’s projecting. Even something like his neck tattoo seems to support his attitude more effectively when you can’t see his face. I think the only way to maintain that tangibility was to keep him masked, so it was a little disappointing that they didn’t. There was only one sequence in the film either edited or revealed untidily and the only reason it stood out was because every other frame was so tight. Upon yet another attempt of the man trying to get inside the house, Maddie goes to hide in the bathroom, weapon in hand, waiting for what could be the end to her life. Her vision is deteriorating, as she sits facing the only door leading into the bathroom, she’s also able to see the side window using her peripheral vision and the room is clearly empty. Yet after what feels like only a few seconds, The Man appears behind her in the bathtub. Was she dreaming the part before or falling in and out of consciousness? Did he somehow bust through the wall and she didn’t hear it? The whole sequence lacks clarity and ends up feeling rather shoddy. Other than seeing a couple of reviews for Hush from the SXSW film festival, I tried to steer clear of all the press until after I had the chance to see the film. My expectations were high enough already without seeing what other fans of the genre had to say about it. This was my first introduction to both Mike Flanagan as a filmmaker and his wife Kate as an actress, I was more than impressed with the result. The location is perfect, the cinematography unbelievably tight and the pacing spot on. It was cleverly lit and the sound effects aid in making you feel like you’re stuck in Maddie’s shoes. The script is well written and doesn’t rely on jump scares or much action to progress the story. The performances are all great, in particular from Siegel and Gallagher who I look forward to seeing in future films. I’ll dock the film a star or so for the couple of remarkably similar specifics used from other home invasion films I’ve seen. The bathtub sequence was a bit of a mess and I think the film’s brutal nature might have been maintained if The Man stayed behind his mask. That aside, Hush is a must see for all Horror/Thriller fans. Make sure you watch it alone and late at night for its desired effect, it’s now showing on Netflix and other various media platforms. I just saw Hush last night on Netflix here in the UK and I loved it. First time in a while I’ve felt on edge watching a horror/thriller. I agree that they should have kept the mask on. I understand the whole ‘didnt see your face / well now you have’ concept but it did ruin Sarah’s murder just before. The point of being a ‘masked killer’ was lost pretty early into the film. I have a different view on the final bathroom scene. To me, it appeared that he was breaking in through the window directly behind her from the glass breaking in while she was drifting in and out of consciousness. It did amaze me that she wasn’t able to feel him stepping down onto the bathtub (vibrations and everything, suppose her entire state would have been affected from the blood loss). I was a tad annoyed when she banged on the window to alert John while John had a big rock ready to knock the guy out – I had high hopes for a good fight between them before John getting stabbed haha. I thought Kate did an amazing job portraying a deaf-mute woman – she did a truly believable job with her body language to convey every thought. For me, the beginning was a little ‘forced backstory’ with the whole ‘is the voice a child? because you were 13 when you got sick right?’ and the excess medical info on the back of her book seemed a little forced to me but it answered questions. I loved the touch of her ‘inner voice’ toward the end detailing the different options she had and her only choice being left to kill him. I really enjoyed this film and am so glad it came to Netflix or I wouldn’t have seen it. Great review as always Adam! and the inner dialogue etc, really dug it and I’m glad you did as well.